Good theater makes you think as you leave the theater. Excellent theater makes you think while watching the scenes unfold before you. That is exactly what David Lindsay-Abaire’s Good People does. 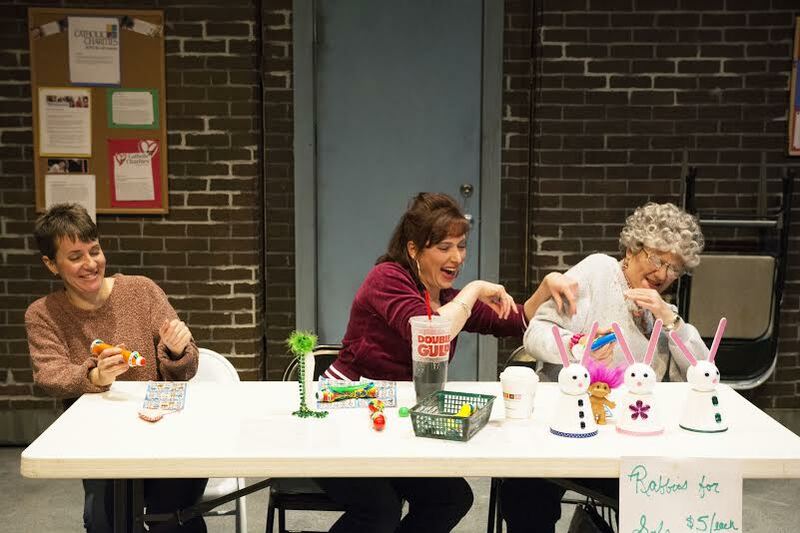 Set in “Southie” on Boston’s Lower End, Good People tells the story of Margie (Jill James) a single mother with an adult daughter named Joyce who has developmental disabilities (who we never see) and her life long friends. In the first scene Margie is fired from her job as a cashier at the dollar store by Stevie (Jacob Rivet). As she begins her search for her next employer she is supported by long time friends Dottie (Shelley Anderl) and Jean (Katie Wodele). These two provide tons of laughs with their constant bickering and needling of each other. They are also the support system Margie has counted on for years when she needs help with her daughter, Joyce. At Jean’s urging Margie reluctantly seeks out the help of Mike, a friend from back in the day who is now a doctor, for a job in his practice. The first interaction between Margie and Mike (George M. Calger) is uncomfortable as you may expect. Calger’s portrayal of Mike is cagey, aloof and guarded. While James’ Margie is tough and acted as though they last saw each other yesterday…not 20 plus years ago. After catching up and reminiscing about the good ole days, Margie proclaims Mike is now a Lace-Curtain Irish and has completely forgotten about his real Southie upbringing. Somehow Margie also manages to invite herself to a very reluctant Mike’s birthday party. As act one closes Margie receives a call that the party has been cancelled due to Mike’s sick daughter. Margie, however suspects the party is still on and she was only un-invited. Act two is where we find all of the drama. Margie makes the trek to Mike’s house out in the suburbs expecting to find the party hasn’t been cancelled. Mike’s wife Kate (Charla Marie Bailey) invites Margie in mistaking her for an employee of the catering company. After the confusion passes Margie and Kate discuss what Mike was like growing up. It doesn’t take long for Margie and Mike to get into a heated argument about their differing versions of a pivotal incident from their teen years. Or how he was fortunate to get out of Southie and make something of himself. It becomes clear Margie is envious Mike was able to rise above his Southie upbringing and make something of himself. He had all the right opportunities and support needed to get out of the projects. Which leads Margie to wonder what if…what if she didn’t get pregnant so young? What if she had supporting parents? What if she went to college? What if she didn’t repeat a grade? Would she be living Mike’s life? Or maybe be a part of it? The what if’s Marge brings up makes you think about your own situation…what if you made the opposite choice at a pivotal point in your life? How much different would your life be? Scenic designer Eric Gustufson designed a unique and cleaver solution for needing a set for five distinct locations for this show…build a large X shaped set with each side of the X representing a different location. Then, with the help of the cast and crew the enormous set is turned to transition from scene to scene. Good People is directed by Kari Steinbach and is running at the Lyric Arts Main Street Stage in Anoka through April 4. For more information or tickets visit their website.